I wrote this article for TechTarget about the fabulous Web Wizard and its uses for mass PDF conversion and quick web publishing of existing documents. It's a great feature that bears re-posting about. It's also really, really not obvious. You just choose File > Wizard > Web Page to open a whole new world of Web publishing, batch conversion to HTML and PDF, and automatic formatting. Put this together with the fact that links in OO.o Writer documents, including linked tables of contents, retain their properties when you convert to PDF, and the potential increases exponentially. 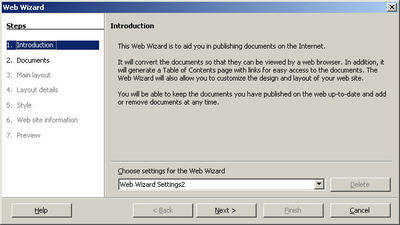 The name of the navigation to the Web Wizard is the same as the previous versions of the software. However, back then, the Web Wizard was nothing but a quick way to get some prefab column layouts and color schemes. In 2.0, it's so much bigger. Create a Web page that links to OpenOffice.org documents, Microsoft Office documents, HTML files, or graphics files you specify. The Web page can have multiple layouts, including a left-hand navigation frame and a right-hand document display frame. You can use the wizard to create a web site from existing documents, rather than designing a new site, copying and pasting into HTML, reformatting, etc. You can use the wizard simply as a batch converter to HTML. You can use the wizard simply as a batch converter to PDF. Got 200 documents you want to change to PDF? Set up the wizard, run it, and go to lunch. You can use the wizard as a poor-user's version of the Photoshop Web's page batch convert feature that lets you take a bunch of pictures and put them together in a convenient form for people to view in a browser. You can do lots of other things that I haven't thought of yet, but that you will come up with when you fiddle with this great feature. Get together the files you want to use. You don't have to, but you'll find it's a bit easier when you're choosing the files and if you have to run the wizard again. In addition, create an output directory for the results of the Web Wizard. Choose File > Wizard > Web Wizard. This is just the intro screen. If you were doing this for a second time, if you were going to repeat a previous conversion, you would pick the conversion options from the dropdown list at the bottom. The first time, though, you just need to click Next. This is the main window. Click the Add button and find the files you want in your Web page, or that you want to batch convert. You can select all the files in the dialog box; hold down CTRL, and select the first and last. Then use the up and down arrow buttons in this window to arrange the files in the right order. In the same window, fill out the other fields, such as title. If you're creating a web page for internal training, put something like Internal Training in the Title field. Now you specify the output format for each file. Select the first file in your list, and in the Export to File Format dropdown list, select the format you want. Do this for each file. For graphics, you can only choose the original file format. PDF Press Optimized is better quality and a larger file than PDF Print Optimized. Click Next. If you're just batch converting PDFs and don't care about what the index page looks like, skip this and go to the step where you specify the output directory. Otherwise, pick the layout of the page where you'll navigate through all the files you just specified. I like the left-side frameset, the first in the second row. Click Next. You can select the information that will be displayed by the link to each file in the index page. Just put a checkmark next to the information you want. Click Next. You can pick the color scheme for the index page but not for the converted HTML pages, if you're converting documents to HTML. They're all a little on the overkill side, though Light Gray is reasonably subtle. Click Next. Enter the information about the Web pages that you want displayed in the converted Web page. Click Next. If you're just doing a PDF batch convert, here's where you come in again. Specify the directory where you want the files created. It must already exist; you can't create it through this window on the fly. You'll also want to name the options you chose very specifically, so you can do this easily another time. Click Finish. Once the processing is done, go to the output directory; these are the files you'll see (they vary depending on if your main index page uses frames). Content is where the main files are. Find the index.html file. Double-click it and you'll see your navigation page, and links to all the converted files. If all you care about is the converted PDF files, open the content directory and you'll see the PDFs. Double-click to open them. Let's look at what a few of the possible outputs look like. We'll start with OpenOffice.org Writer files, with a frameset navigation index page, converted to HTML. Now, let's look at OpenOffice.org Writer files, with a frameset navigation index page, converted to PDF. Graphics files (JPGs), with a frameset navigation index page, left in their original format. Excited yet? I hope so. The Web Wizard is a good, flexible system with implications for reducing workload by a huge amount. OpenOffice.org isn't really known for its killer Web page development features, and, of course, Web Wizard doesn't turn it into DreamWeaver. But if you need quick conversion of existing documents, rather than delicately nuanced Web design, this Web Wizard feature is definitely for you. On some Windows systems, this feature will work one time but not additional times. A message will prompt you to run Repair. You can try, but it probably won't work. If this is your situation, the bug has already been filed with the OpenOffice.org project team, so the best you can try is to install it on another machine, or wait until the next update version comes out. Note: This blog has two related posts, on PDF in general and on Impress and links. Also note that the PDF editing feature in 3.0 (actually an extension, extensions.openoffice.org) makes the PDF features in OpenOffice.org even more amazing. If you ever put any documents on the web, you might need only one application: OpenOffice.org. I'm not talking web design—I'm just saying, if you work for the city government and need to post long pages of forms for people to download, or if you need to publish reports that people can easily find their way around in, or if you're a technical writer and create user manuals with the usual thousands of links within the document and to other documents—you might be good to go with only OpenOffice.org. What Makes Me Think OpenOffice.org Is Such a Great Publishing Tool? This is because of three things. 1. In OpenOffice.org, you can create links. You can just type "Click here to go to the web page," select some text, and link it to any web site you want. You can automatically generate a linked table of contents, so that anyone clicking on an item in the TOC is taken directly to that heading in the document. You can put links in headers and footers. Have a link that says "Back to top" that appears in your footer, and you've got great navigation. 2. You can make a PDF document from your OpenOffice.org document. 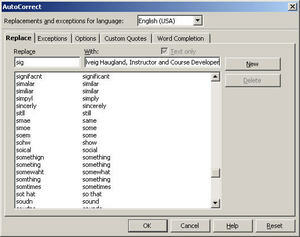 From a Writer text document, Calc spreadsheet, Impress presentation, or Draw drawing, with OpenOffice.org. Just choose File > Export as PDF. Or even easier, just click the PDF icon on your Standard toolbar. 3. In OpenOffice.org 2.0, the links you make in OpenOffice.org transfer over to and work in the PDF. These are all very important and useful. Put'em together and you have huge power. Take a look. Here's a document I made using only OpenOffice.org, created the linked TOC automatically and the links between sections manually using only OpenOffice.org, and generated the PDF using only OpenOffice.org. Here's what I did in the document--I didn't do a huge amount of cross-references but I did do enough to demonstrate the power, I hope. A. There's a table of contents that I generated automatically, and made hotlinked to each section, automatically. Click on a link in the TOC and it goes. 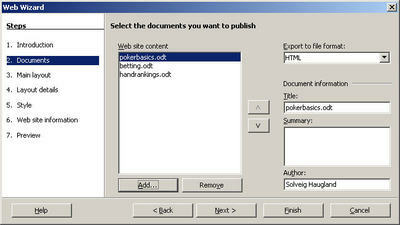 To create a hotlinked table of contents, in your Writer document choose Insert > Indexes and Tables > Indexes and Tables. To make the hotlinks, click the Entries tab of the window, click to the left of the E and click Hyperlink, and click after the E and click Hyperlink again. Click All to put hyperlinks on all levels of the TOC. Click OK.
B. At the fine, innovative suggestion of Dave Richards of the City of Largo, I put a link in the footer that says “back to top.” This text is linked to the Table of Contents heading so that clicking that link in the footer takes you to the table of contents. You could also add footers that say and link to "back to whatever you want." You could add headers and link them back to the original Head1. You could add a manual link at the end of any major or minor section to go back to the beginning of that heading. To turn on the footer, choose Format > Page, click the Footer tab, mark the Footer checkbox, click OK. Then click in the footer text box that appears and click OK.
Click this image to see a larger image if you want. Type the text you want in the footer text box. How the heck do you make the link now that you're in the footer or header? That's next. To link an item in a header, footer, or anything else, see the next point. C. I added links at the beginning, and to any interesting web sites, throughout the document, using the Hyperlink icon on the Standard toolbar. Links such as "This section covers the following topics" with a bulleted list containing three links. Here's how to create a manual link to a web site, other point in the document, etc. Select the text that you want linked. Click the Hyperlink icon on the Standard (top) toolbar. In the window that appears, think about what kind of link you want to make. To link to a web site, just click the Internet icon on the left, and type the URL. Click Apply. To link within the document, click the Document icon on the left side. Then click the round stopsign type icon by the Target in Document field, and you get the navigator. 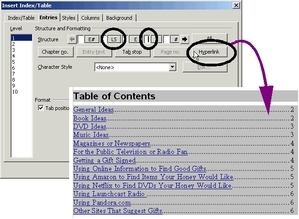 In the navigator window, you can link to any heading, table, object, etc. in your document, or in any other document. Click this image to see a bigger image if you want. Note: You'll see that Headings, the TOC, and also other objects like tables and bookmarks show up. You can link to any of them. Headings are anything to which you have applied Heading1 paragraph style through Heading10 paragraph style. More specifically, it's whatever is set as the headings under Tools > Outline Numbering. You can click anywhere and insert a bookmark by choosing Insert > Bookmark and naming it. Then all those bookmarks automatically show up in the Navigator list and you can link to them. Select the item to link to. Once you're back in the Hyperlink window, click Apply again. The same text, a little technical looking, will show up in the Text field at the bottom of the page. This is the text that will appear in the document. Then click Close. You'll see the text in the document, linked to the item you selected. With those three attributes, you can make a document that's extremely useful. The final step, once you do all this in OpenOffice.org, is to export to PDF. Choose File > Export to PDF. Name the file. 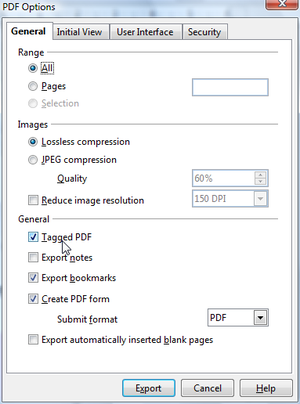 In the PDF options window, specify a page range if you want, and make any changes to the graphics quality. (If you can, keep the JPG compression as high as possible.) Then click Export. Here's the PDF Options window.Click it to see a larger version if you want. BE SURE TO SELECT THE "TAGGED PDF" OPTION to make the links convert to links in the PDF document. Click Export, name the document, and you're done. Take that PDF copy of your document and post it to your web site, email it to whoever needs it, or just do whatever needs to be done to distribute it to the folks who need it. Think Links and Think PDF! It reduces repetitive work, gives you and your organization extra powers, and will make you look very cool when you introduce this slick, labor-saving approach to distributing documents. I wrote this article for TechTarget about the fabulous Web Wizard and its uses for mass PDF conversion and quick web publishing of existing documents. This is a "classic" post but it's a great feature that bears re-posting about. So you can make PDFs from OpenOffice.org documents. Excellent. What if you've got a PDF already that you didn't create, and you want it in a format like this? Stephen Abrams linked to from David Rothman writes about BookletCreator, a free tool that lets you create booklets from PDF files. It reorders pages so that after printing and folding the pages you get a small book. 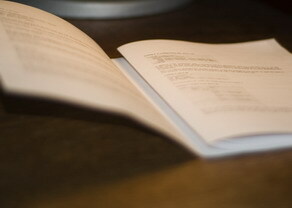 Btw, I've got an upcoming blog on how to create booklets from Writer documents. It's scheduled down the line a week or two. As if it wasn't enough that OpenOffice creates PDFs with lots of features you'd expect to see only in Acrobat, they're also working on this PDF Import feature. They've reached the first milestone. Here's a mockup screen shot of what it might look like when you open a PDF in OpenOffice.org. Read more about the actual features of the import extension here. A friend emailed me asking about templates for creating online help like you usually get by pressing F1. I didn't know of any, though I suspect that if you found one in Word, it would work OK in Writer. That got me thinking about the PDF function, though. You can use the built-in ability to link to different headings and fields, and the PDF output function, not to mention the easy automatic hotlinked table of contents feature, to make some very nice PDF online help. Heck, with a little hacking you could be single-sourcing your online help and manual documentation. My main point here, though, is to provide a template with which anyone can easily start making online help. So I've posted various tools. A semi-empty template you can start using immediately. Right-click on the link for this and choose to save it, rather than clicking on the link to open it. The same document containing sample text and detailed instructions, in document rather than template format. Right-click on the link for this and choose to save it, rather than clicking on the link to open it. Use the Insert > Hyperlink feature or the Hyperlink icon to link to various points within your document. You can link to any text that has a heading style applied to it, to graphics, tables, bookmarks, etc. Update the TOC when you change anything, and it'll automatically show everything correctly. Choose File > Export as PDF when you're ready to produce. Note: Here's a related article I wrote for TechTarget.com. What's better, software that does what it thinks you want, or software that does what you tell it to? If it's rocket-launching software, and I don't know much about rocket-launching, I guess I would let the software do what it wants. However, I know what I darn well want my office suite software to do. I know how I want it to behave. I know what features I want and I know, for instance, that I do not want it suggesting to me what word I am typing and offering to help me finish the arduous task of typing it. OpenOffice.org has its default behavior and default settings just like any other software but is very cooperative in letting you customize those behavior and settings the way you want them. Which is refreshing. You just have to tell it how to behave. So I've put together a list of the top customizations I think are the most helpful and/or powerful. I make sure that everyone in my classes learns these by lunchtime, and review them afterwards. When the software behaves the way you want, that makes everything better. 1. Turn off the word completion. 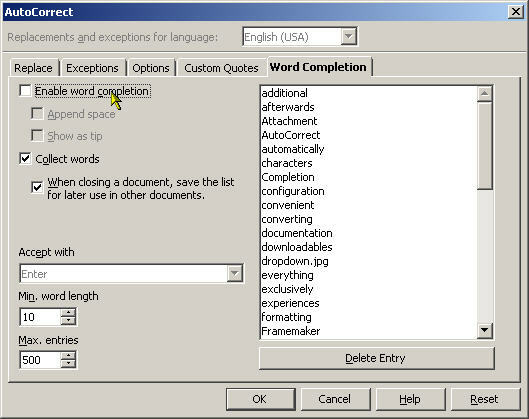 I hate word completion, and it’s really easy to turn off. 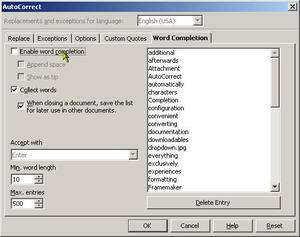 Choose Tools > AutoCorrect and click on the Word Completion tab. Make sure the Enable Word Completion option is unmarked, and click OK.
2. Turn off any automatic formatting that you don’t want. Would you let people live in your house who you didn’t know? Then you don’t want automatic formatting going on that you don’t understand. Choose Tools > AutoCorrect and click on the Options tab. Unmark everything except the top option, Use Replacement Table. Then go back through and see if you really want anything. 3. Use the automatic formatting to create handy shortcuts. A. In the left-hand field type your shortcut like sig and in the right-hand field, type the word you’re tired of typing all the time. B. Click New, then click OK.
C. Click the Options tab and be sure that both checkboxes for the top item, Use Replacement Table, are marked. That just means "use the stuff in the Replace tab." D. In your document, type the shortcut, followed by a space, and your word will appear. 4. Display the icons that you want. There are a zillion icons in OOo as with any software and you probably don’t use all of them. There’s also that dandy little result of having to click on the black arrow to get to the icons you want, while the ones you do want sit there taking up space and, quite frankly, smiling a bit smugly. So take off the ones you don’t want, leave room for the ones you do want, and add some other ones. First step is to take off the ones you don’t want. Click on the dropdown arrow and choose Visible Buttons. Find the icons you don’t want, like double spacing, and select them. That’ll remove the checkbox by them, and that removes them from the toolbar. Now add the icons you want. The first thing to try is to click the dropdown arrow again and choose Visible Buttons. If the icon you want is there, select it and it’ll appear. If the icon you want isn’t there, click on the dropdown arrow again and instead of Visible Buttons, select Customize Toolbar. Find the toolbar you want to add icons to. Click Add, and in the window that appears just keep looking through the categories on the left til you find the feature you want in the list on the right. Select it and click Add. Back in the customization window, you can leave the icon as is and just click OK, or change the icon by clicking and holding down on the Modify button and choosing Icon. 5. Get to know the choices under Tools > Options. Choose Tools > Options, and you’ll see the big fat configuration window. Just as the items under Tools > Autocorrect were about default behavior, Tools > Options is about default settings, default values. Anything about the program, from icon size to language settings to where the program looks when you choose File > Open, is set here. I suggest that you open the OpenOffice.org (or StarOffice as in this illutration) item at the top, then select Paths, and change the values for any paths you use a lot. Change the My Documents item, for instance, to change the default for where OOo tries to save documents. You’ll save a lot of time scrolling around in your Save windows. To change the path, select it in the window, click Edit, and just point to the new location. You might also want to expand the StarOffice Write item, select Default Fonts, and choose the ones you prefer. When you’re done, just click OK. I find this feature entirely un-annoying, but you can turn it off easily if you want. Autorecovery means if OpenOffice.org crashes or you have to coldboot your machine, at least you'll have something recent to return to. If you're hypervigilant, increase the interval to every minute or 5; if you don't care about it, set it to every hour or just turn it off. Choose Tools > Options > OpenOffice.org > Load/Save > General. You're looking for the Save AutoRecovery Information Every option. Unmark it, or change the interval. Click the thumbnail below to see a bigger image of the window. Now OOo is more like a well-behaved pet and less likely to jump up at you, licking and biting inappropriately. Those are not all the configuration steps you can do, by a long shot. But I like them, and students seem to like them. And they're an important set of steps in the general process of showing that OpenOffice.org does what you tell it to do. Note: This blog has two related posts, on PDF in general and on Impress and links. Originally posted January 2006. I'm going to make a bold statement. If you ever put any documents on the web, you might need only one application in your life: OpenOffice.org. Note: This blog has two related posts, on PDF and links and on PDF in general. Originally published January 2006. On the computer where you give presentations, is the right software always loaded? Do you go through life with absolutely no problems showing your slides? Well, cleverly, you have already created a PDF of your presentation, which you can simply run using the Adobe Reader application available on every computer in the universe, except maybe a couple. You won't have your animation effects or slide transitions, but as a riveting speaker with important things to say, you don't need that. To make a PDF of your presentation, just click the PDF icon on your Standard toolbar (the top one). Name it in the window that appears. That's all. Here's a snapshot of what it looks like in the Adobe Reader. Click on it to see it full size. Here's a short presentation in OpenOffice.org, and the PDF copy I made using exactly these steps. To show the presentation in Adobe Reader, you can use the Pages tab to show thumbnails and go from slide to slide, or just use your Page Up and Page Down keys on your keybard. View at 100% or whatever works. You might not always need to do this, but it certainly does seem like having a PDF backup at all times could be a good idea. Note: You can also export to HTML, and to Flash! Just choose File > Export, select HTML or Macromedia as the format, and follow the wizard. Note: This blog has two related posts, on PDF and links and on PDF and Impress presentations. Originally published January 2006. If you're not using PDF with OpenOffice.org now, or if you don't use PDF period, please read this. It's going to make your life so much easier. Everyone doesn't have the same software. Some people are on Microsoft Office 95. Some people are on WordPerfect. Some are on Microsoft Office 2003. Some are on OpenOffice.org. Some are on NeoOffice, AbiWord, LaTeX, etc. Some people use Framemaker. Some use Quark, Publisher, InDesign,and other page layout programs. And don't even get me started on the different platforms. What about printing companies? Does Kinko's or Colt Reproduction or your friendly neighborhood printer have your exact software, platform, and version? Probably not. So when you have to send your annual report, or your resume, or your new novel, or the forms everyone in the city needs to fill out, to someone else to read or print.....sending it to them in the format of your own office suite, however common it might be, probably isn't a good idea. And the more people who have to download or receive your document, the less likely they'll all have the right software to read your document, if you send it to them in the format of the software you used to write it. That's what Adobe thought when they came out with the Adobe Reader and the document format called PDF. Portable Document Format. When you have the Adobe Reader program on your computer, you can read any document in the Adobe PDF format. It's like the Esperanto of document formats, but good. Everyone uses it. Every computer in the universe, with the exception of maybe five or six, has the Adobe Reader software, so everyone can read any document in the Adobe PDF format. The Adobe Reader program is absolutely free, too. If you happen to not have it, you can go to www.adobe.com/reader and download it. OK, but how do you make a PDF? You've got your meetingminutes.odt or annualreport.doc file. How do you make it all PDF-y so that everyone can read it in this Adobe PDF format? Well, in OpenOffice.org you just click the PDF icon on your toolbar. Name the new PDF copy in the window that comes up and save it. That's all. Click, type, click. You can now send your document to anyone in the world with a computer and they can read it. Here's a document in OpenOffice.org (right-click on the link and choose Save Target As) Writer and the version I made in PDF. 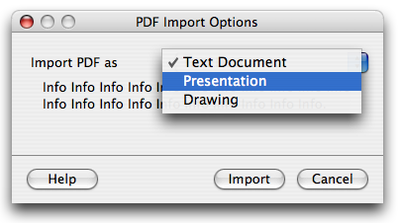 You can also choose File > Export as PDF. That way you get more control as in Distiller. Be sure to select the Tagged PDF option if you want any links in the doc to be links in the PDF. If you're using another office suite or layout application, it's more involved to create a PDF. You can buy the Distiller program from Adobe for several hundred dollars if you want a really advanced program for creating PDFs. If you're using Microsoft Word, or anything else from Microsoft, you don't have the built-in capability to just click and make a PDF. OpenOffice.org has something that's very important for working with other people. Microsoft (and most other applications) doesn't. What's up with that? PDF is important and a huge timesaver if you ever have to give your documents to other people. Making PDF is built into OpenOffice.org, and it's incredibly easy. Working with a professional printer is so much better with PDF. Sometimes it's the only way. If you need to print 200 copies of your report, spreadsheet, presentation, or any other document, it's much easier to make a PDF of it and upload it to www.kinkos.com, than to take a hardcopy down there. If you're writing a novel and want to self-publish it, it's easy to make a PDF and any printer can crank out copies. Here's a note. The PDF document you create is not editable. If you need to send your report.ods to someone else who will make final changes to it, you'll need to send the file format they use. Choose File > Save As and pick a format in the type list. But you know what? Even people who ask for a .doc format all the frickin' time don't really need to edit the document you're sending them. They just don't know about PDF. PDF rocks. That's why PDF is important, and how to do it. If you want to read about links and PDF, which takes the whole PDF/document distribution thing to an even higher level in OpenOffice.org, see this blog. To read some tips on using Adobe PDF format and presentations, see this blog. First, thanks again to all who gave me great tips on items to include in the OpenOffice 2 book. I have incorporated the suggestions that I have room for (it's primarily a beginner/intermediate book). I'm hammering home styles, I'm trying to make it very easy for people to integrate templates, I'm talking about graphics and frames, lots of stuff on tables, autotext and shortcuts are definitely in, and I'm enhancing the chapter on working with MS Office. And of course I'm doing lots of mail merge tools, with tips on creating a separate Envelopes printer, as well as using the Secret Mail Merge Louis told me about. I'm also going to add Ross's excellent suggestion to try nested frames. Here are the caveats and review guidelines. This is DRAFT material. I've been back through it but it hasn't been edited or proofed. I haven't completed the chapter on working with Microsoft Office users. I need to research more specific problems and solutions, though I think the tips in the chapter will take people a long way. You can use these chapters yourself but of course not reprint them, publish them under your own name, etc. Feel free to just download and read. If in addition you'd like to comment, please follow these guidelines. It's too early for typos, so you don't need to worry about those. Tell me other things you'd like to know about. Tell me anything that's wrong. I'd love to hear about solutions you've come up with or tips you'd like to contribute. Thanks! I appreciate all input. I'll most likely post additional chapters before it's published. I've been having a problem that some of you might sympathize with--getting posts to show up in Technorati. So as a cheater, I've created this post that links to a bunch of posts that I don't think have been showing up. Not all of them like links to current discussions or issues, just the ones I think are important that have been missed. So I'm sorry this isn't new content, but perhaps somewhere in the last six months there's something useful that Technorati didn't let you see the first time around. The styles posts on what they are, how to get styles from one document to another, how to create and update them, etc. Setting up OpenOffice under Tools > Options and Tools > Autocorrect. This is how to turn off word completion, stop automatic formatting, set defaults, increase icon size, and much more. Charts in Calc and Writer; how to click in just the right spot and modify exactly what you want. Opening a CSV text file in Calc so that it opens as a spreadsheet. Useful if you export files from databases of other formats and want to create them as spreadsheets or databases in OpenOffice. Controlling what people can put into spreadsheets with error messages, online help for the cell, ranges of permitted data, etc. PDF, with linked articles on PDF presentations, and using hyperlinked PDFs. That post is particularly interesting since you can generate PDFs from linked OpenOffice.org documents, and the links carry over to the PDF. 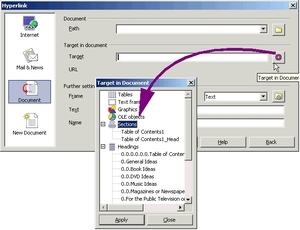 Using the wonderful Web Wizard (that's the techtarget article, here's the blog link) for creating web sites from existing OpenOffice, Microsoft, and graphics documents. You can also use it for PDF batch convert. The very very powerful Mail Merge Wizard. The less powerful but far easier Secret Mail Merge that you need to add to your toolbar. Creating OpenOffice.org databases from spreadsheets, text files, and your address book. Even Access databases are easy. A bunch of articles for TechTarget.com on creating databases from scratch in Base, creating forms, doing reports, views and joins between tables , and all the fun new stuff in the Openoffice Base database module. How to do labels the regular way, and manually. My thoughts on training and its benefits. My suggestions for transitioning to OpenOffice.org, including the change management aspects. Why OpenDocument Format is important (parental advisory, contains references to tube tops). Switching to OpenOffice.org, or any open source product, means you can spend the budget leftover on something important. Education, firefighters--anything that's more important than using Microsoft Office. Office 2007 could be a big retraining job. Think about whether you'd rather spend money and time upgrading to Office 2007, or just time on switching to OpenOffice. This article I wrote for TechTarget is about the fabulous Web Wizard and its uses for mass PDF conversion and quick web publishing of existing documents. And how it's just been hiding there from me for months. Cheeky wizard. Update March 4th: The article was posted on Lifehacker.com! I'm very excited. It's been a very big week--I was Newsforged for the Office 2007 blog and Lifehackered for the web wizard article. Note: If you're not familiar with PDF, read this post. If you do a lot of online publishing of your PDFs, see this post to take advantage of links. Psst! Do you like PDF? Do you like easy, free ways to convert to PDF? Do you have a bunch of PDF files you need to convert at once? I'm talking PDF batch convert. Do you need to convert web pages to PDF? And are you the type who doesn't mind just a bit of a hack to get cool results? Then you are going to love this feature. You might not have noticed a PDF Batch Convert feature in OpenOffice.org 2.0. That's because it's a Web page wizard, under File > Wizards > Web Page. This is OK—the Web wizard has some really cool features for web publishing but I'm all about PDF so that's what I'm concentrating on. All right. Here we go. We're going to start the Web wizard, select the OpenOffice.org files you want to convert to PDF, specify where the output goes, ignore the extraneous HTML files in the output directory, and have ourselves a really dandy PDF batch convert process. 3. Now you'll see the window where you put the files to convert to PDF. (Click it to see a larger image if you want.) Just click Add and find the files—Writer files, whatever you want. 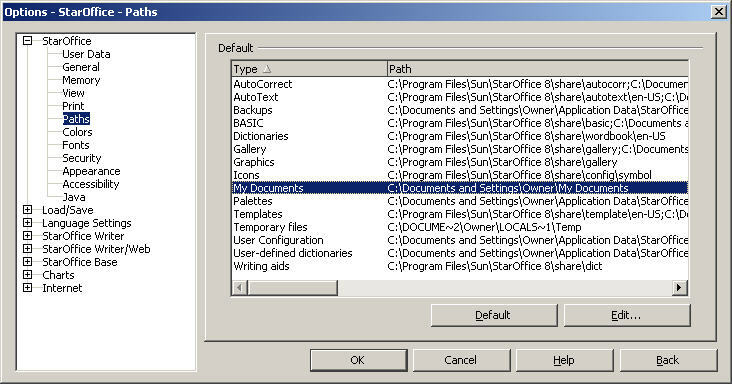 You can select all the files in the directory at once; just hold down Ctrl and select. 4. Now you say, convert these to PDF for me, please. 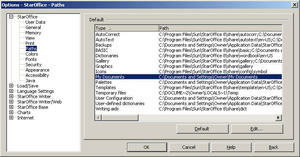 For each file, select it and in the dropdown list, select the format to convert to. Select PDF for press for higher quality. 5. When you've specified PDF for each, click Next a few times to get to the last window. 6. Specify the directory where you want the PDF files created. 7. Then just click Finish. 8. The PDFs will be created in the directory you specified—but inside a Content directory, along with an index.html file and other stuff. 9. Just open the content directory, and you'll see your PDFs. Isn't it slick? I think it's great, and wanted to make sure you know about it since I just stumbled upon it on my own. Now, there's a teeny issue. On my Windows desktop, but not my laptop, this doesn't work.It works the first time but not the second time. A message pops up saying the files aren't there, and to run repair. Running Repair doesn't work. The bug has been filed but not a lot of people get it. So if this doesn't work for you, just wait for the next rev, or try it on another machine. Everyone's got their favorite features that make life easier, more fun, or both. Here are a few of my favorites. One of the greatest, most convenient features is the ability to make Adobe Acrobat PDFs from any OpenOffice.org document. Why is this cool? Because anyone can read a PDF document no matter what software they have (since everyone has the little program for reading PDFs). It’s the perfect way to send a document to someone else, if they don’t need to change your document. Just click on the handy PDF icon on the top of your work area, give it a name and specify a location for the PDF file, and click Save. Then email that mydocument.pdf or quarterlyreport.pdf document. 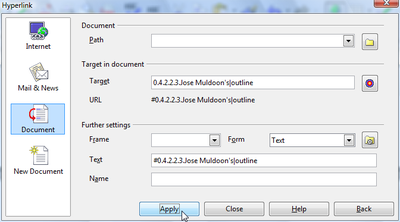 If you want more control over the PDF, choose File > Export as PDF, name the file, then set options in the next window. To make it even quicker, choose File > Send > Document as PDF Attachment. That starts your mail program, creates a new mail document, AND attaches a PDF of your current document to that email. It really doesn’t get much slicker. Or if you don't need a PDF, just choose File > Send > Document as Email. When you're pasting from Microsoft Office to OpenOffice.org, or from OpenOffice.org 2.0 to OpenOffice.org 1.x, you're not going to get text. You're going to get a frame of text or an icon object. What I've done to get around this is to use Notepad as an intermediary. But it's a whole lot easier to use OpenOffice.org's multiple paste format features. Either choose Edit > Paste Special and choose unformatted or formatted text, or just click on the paste icon and choose your option. Formatted Text (RTF) usually works just fine. Choose Tools > Options > OpenOffice.org (or StarOffice) > View and make sure the icons are large enough. I like to see my icons, not squint at them. I used to curse the indenting and levels of OpenOffice.org lists until I started using the specialized object bar. Choose View > Toolbars > Bullets and Numbering, or just make a list and the floating one pops up. Also, when you're developing complex list formatting, always use the numbering/bullets formatting window (Format > Bullets and Numbering) and use only the last two tabs, Options and Positioning. These are the only tabs that let you specify specific formatting that's different for each level. This was in my configuration blog too but I really like it. The same tab where you turned off word completion (Tools > AutoCorrect, Replace) has a really great feature for creating shortcuts. Let’s say you type the word supercalfragilisticexpealidocious a zillion times a day, or your name and title, or anything kinda long. You can set up a shortcut for it. Just choose Tools > AutoCorrect and click on the Replace tab. In the left-hand field type your shortcut like sig and in the right-hand field, type the word you’re tired of typing all the time. Click New, then click OK. In your document, type the shortcut, followed by a space, and your word will appear. I might be pickier than most about the color I want for drawings, but for one thing, I don't like the greens that come with OpenOffice.org. Too dark or too limey. So I make my own. Choose File > New > Drawing, then choose Format > Area and click the Color tab. Or just choose Tools > Options > OpenOffice.org (or StarOffice) > Colors. Click Edit and fiddle til you have the color you want. Click OK, then type a new name in the main color field and click Add. The new color now shows up in all color lists including the font color lists. Following the navigation for doing this in Draw, you can make your own gradients, hatches, and bitmaps in the same window. In Draw and in Writer, you can use the 3D shapes to, well, draw 3D shapes. Even better, you can make them intersect. Draw two shapes, select one, cut it, select the other one, press F3, and paste. Then move them together. To change their orientation, click on each shape once to get green handles, then again to get red handles, and swivel them around. I'm not sure how useful this is to everyone but it sure is cool. You can also convert any item to 3D, in Draw. Choose File > New > Drawing and create any shape, even text. Then right-click on the shape and choose Convert > To 3D. Shazam.